Decimated by the loss of its main event, UFC 215 wasn’t expected to deliver much as it competed with 208 for the year’s weakest PPV card. But even without the significance of a historic night after Demetrious Johnson was cruelly denied his shot at breaking the consecutive successful title defence record following Ray Borg’s illness last week, the card still had plenty of pop. Indeed, the Canadian crowd in Edmonton were treated to some stunning finishes and we pick out the top four storylines to have arisen from the event. 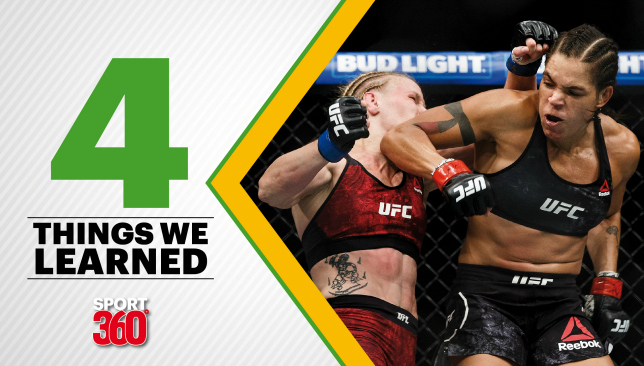 It was tactical, technical and at times a little tedious but Amanda Nunes successfully defended her bantamweight title and made it 2-0 against Valentina Shevchenko in the reshuffled main event. The Brazilian edged another razor-thin decision against Shevchenko in a fight which saw a women’s 135lbs title fight go the full quota for the very first time. A far cry from the beatdown she dished out on Ronda Rousey, Nunes was calculated and composed, recognising the challenger is dangerous. Ultimately, she was safe, conserved her energy and power until deep into the fight and just did enough to squeak the decision, much to Shevchenko’s vexation. It was a new side to the overwhelming destroyer as Nunes dispelled the criticism of her gas tank with a mature performance. No-one can begrudge the champ of a more sheltered approach because we know she can throw down and now she moves onto new challengers who it will be hoped do more than Shevchenko to try and win. Like a Pokemon evolution, former 125lbs title challenger Henry Cejudo levelled up his striking style to that of 155lbs champ Conor McGregor. In arguably the most impressive performance of UFC 215, Cejudo dismantled Wilson Reis to launch himself into talk of another shot at Demetrious Johnson. And he did it adopting the wide karate stance made famous by McGregor and Lyoto Machida – the latter playing a big role in his training camp. It wasn’t just the stance which drew the comparisons with the Irishman, though, as Cejudo’s calm state and oblivious reactions to getting tagged were McGregor-like. Even the deadpan look on his face was like McGregor and the finish was just as emphatic as he landed a blurring straight right in the second round to finish Reis. Cejudo talked post-fight about his “evolution” and the Olympic gold medallist in wrestling has certainly developed. Whether it’s enough to avenge the first round KO he suffered to Johnson in April 2016 is a debate for another day. RDA IS A CONTENDER BUT WHO IS NEXT? Another standout performer from UFC 215 was former lightweight champion Rafael Dos Anjos who made it 2-0 as a welterweight. 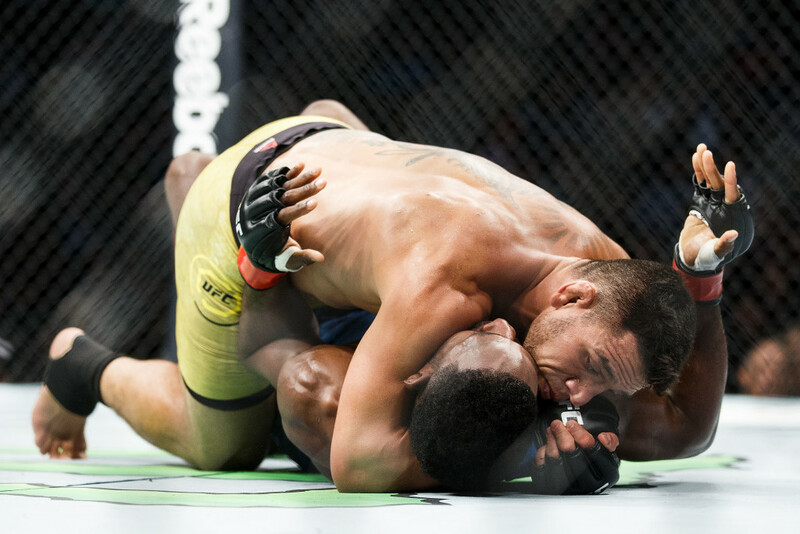 The Brazilian made short work of Neil Magny as he wrapped up an arm-triangle choke in the first frame to get his first submission win since 2012. RDA gave up a staggering 10-inch reach advantage on Magny, but despite the physical discrepancies, looked not just at home in the 170lbs division but a potential candidate to join the exclusive two-weight champion club. The question now, is who is next for the 32-year-old? Fortunately, he’s not short of options as the top-10 is littered with killers. Donald Cerrone, who he decimated in a lightweight title fight, lies ahead of him in the rankings while the winner of Stephen Thompson/Jorge Masvidal at UFC 217 is an enticing prospect also. There is one match-up which really salivates the mouth, however, and that is Robbie Lawler. Make it a title eliminator later this year and the UFC will have a strong set-up for the division in 2018. 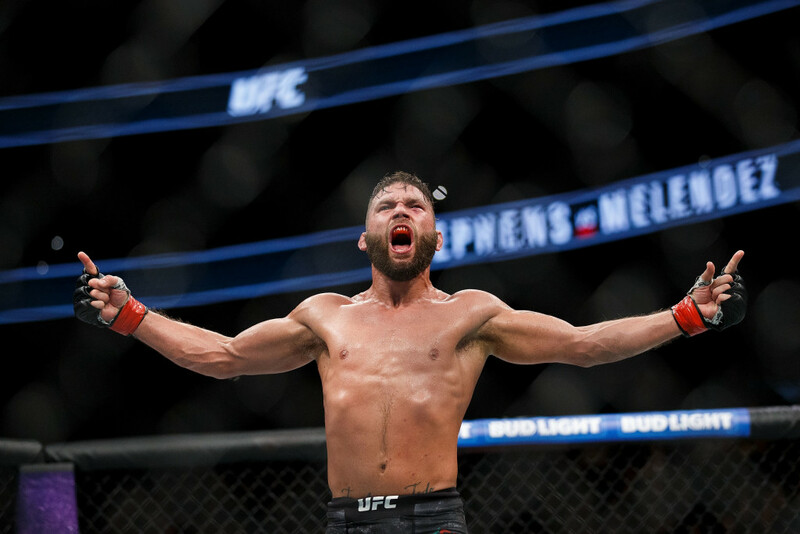 The savagery Jeremy Stephens displayed in repeatedly attempting to dismember Gilbert Melendez’s legs was slightly overlooked because of his opponent’s brave ability to cling on for three rounds, despite huge knots forming on his shins from the ruthless leg kicks. Like a perpetually swinging axe, Stephens completely dominated Melendez to take a unanimous decision, but we’ve been here before and an impressive victory is usually followed by a disappointing defeat. ‘Lil Heathen’ must deliver in his next fight if he’s to crack the featherweight top-five. Conor McGregor has settled his business with boxing, likely banking $90million from his defeat to Floyd Mayweather. The digits generated from the event are trending towards the billion-dollar mark and ultimately the fight will be viewed as nothing more than a transaction. Indeed, the Irishman had no real right to be in the squared circle because his place of work resides in the cage. And in the Octagon there is some unfinished business to attend to. The UFC has a storied history of classic trilogies and either December 30 or 2018 will see another iconic rivalry added to the list because McGregor’s next opponent is a simple choice – it’s Nate Diaz. The Irishman’s admirable performance against Mayweather had some sections of the media pinning their hopes on a return to the ring but the talk is nonsense because only the Diaz fight makes sense. In terms of pay-per-view attractions, the UFC has hit the poverty line and McGregor is their only real bankable asset. With the Mayweather clash reportedly amassing a global PPV audience of 6.5million, a fraction of that viewership will likely be buying a McGregor boxing bout again. 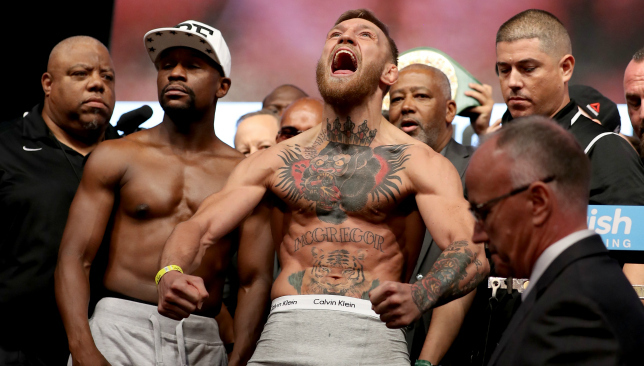 The UFC simply can’t afford his first fight back to have an anticlimactic feel and right now anyone at 155lbs – the division McGregor rules – falls into that category. Tony Ferguson and Kevin Lee scrap for the interim lightweight belt at UFC 216 next month but neither are close to reaching the PPV potential needed to entice McGregor, though that could change come October 7. Looking at the landscape now, McGregor-Diaz III is the only sensible option. 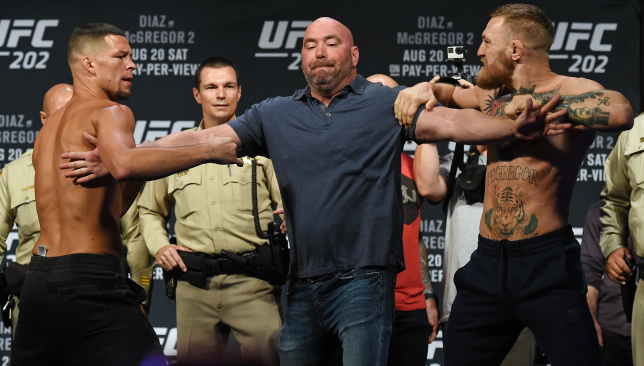 The backdrop is in place already and competitively the pair are tied at one apiece, McGregor claiming the rematch at UFC 202 after being submitted at UFC 196. Fans are already invested and to the new ones segwaying into MMA from the Mayweather fight, it’s a narrative easy to sell and simple to pick up. The guarantee of interest equates to a guarantee of PPV sales and no other fight at 155lbs offers that. Of course, McGregor could move up to 170lbs and challenge for the unprecedented feat of a third belt but the logjam is bad enough as it is. Even the Diaz clash presents its own problems. Indeed, the winner of Lee and Ferguson will naturally ascend to an undisputed title shot but the contextual element of Diaz could see him jump the queue. The 32-year-old hasn’t fought since his defeat to McGregor in August 2016 and hasn’t shown any interest in changing that. Only the trilogy would bring him back to the Octagon and a win would likely be the last we see of him because according to his boxing coach Richard Perez, he’s looking to be paid big to face McGregor. “Come on. UFC’s making a whole lot of money, a whole lot of money and they’re pocketing it. That figure might be the starting point of the negotiations and in reality they’ll meet somewhere in the middle. But the derision Diaz received from that figure being thrown out is misplaced. He is taking advantage of the situation and he is in the perfect position to get the big money fight. At the end of the day, that’s just good business and McGregor knows a thing or two about that. Conor McGregor has been compared to Manchester United striker Zlatan Ibrahimovic – by the Swede himself. The Irishman makes his boxing debut in a megafight with Floyd Mayweather in Las Vegas on Sunday (07:00 UAE time) and taekwondo black belt and MMA fan Ibrahimovic has backed McGregor to shock the world. The striker recently agreed a new one-year deal to stay at Old Trafford having been initially released following a serious knee injury. Speaking about the fight to Sport Bible, the 35-year-old said: “Here you have a guy that has made a career out of many years and that is Mayweather. “Me as a huge fan of the MMA, I see this fight. I don’t know. It can go both ways. Either what people predict that Mayweather will win easy, which I don’t believe. “Conor has a power he can knock you out from every angle. And he has a confidence, like me. “He is the Ibrahimovic of martial arts and I’m McGregor of the football world. “So I see him with his confidence. He will win. Because he believes in himself so much and like I say, in everything you do the mental part is 50 percent.